HAROLD BAIM AND "TELLY SAVALAS AND THE QUOTA QUICKIES"
We also got a short film, usually a travelogue, running between 15 and 30 minutes. As an audience most of us didn’t realise that these films had to be shown – by law. The projectionist probably called the short documentary the “Quota Quickie”. From 1927, when the ratio of American import to British film had dropped to sixteen to one, the Government acted to prop up the failing British film industry and by Act of Parliament introduced a mandatory “quota” of British made films. The Cinematograph Films Act of 1927 forced distributors to show a healthy percentage of British made product. One thing that was overlooked in the Act was any sort of “quality threshold”. The short films, made to a budget to fulfil the quota requirements, could be very cheap and often very poor. Some producers attempted scripted dramas – the “B” picture. Others made documentary features. The lack of investment in the films had the undesired effect of giving the British film industry a bad name at home and abroad. However, the quota system continued and was renewed by successive governments every ten years or so. It did bring forth some great cinematic practitioners. The great Alexander Korda was responsible for films made for the quota and produced successful dramatic offerings starring early film performances from Merle Oberon, Laurence Olivier, Jessie Matthews, Vivien Leigh, Rex Harrison, Cecil Parker and others. Dramatic features proved financially too high a risk for most producers and by the ’50s and ’60s the quota was filled by short documentary features. On the Rank circuit, Look at Life received a block booking in every cinema. At A.B.C. it was Pathé News or Pathé Pictorial. Research has shown that only sixteen copies of Pathé Pictorial were printed each week and were shown in random A.B.C. cinemas and some independent cinemas. So, with such a small number of prints and sometimes questionable editorial content, many of the films were unloved and prints and negatives discarded after their original distribution, others lost in the vast Rank vaults. American distributor United Artists struck a deal with British film maker called Harold Baim and by the mid ’60s Baim’s films numbered about a third of all short “quota” films made in the UK. United Artists distributed some of the greatest cinema hits of the ’60s including Tom Jones, the James Bond films and the Beatles films. Many of these films lasted longer than the average 90 minutes and United Artists were able to insist that they were accompanied by one of their own shorts - produced by one man, Harold Baim. Harold Baim made all his films from the 1950s onwards in colour and many in wide-screen formats. Baim only filmed on sunny days; aware that his short features would be seen by audiences next to major features filmed in California or the Mediterranean he wanted to make sure they looked just as big and exciting. There is a story about filming Telly Savalas Looks at Birmingham. When he awoke in his Birmingham hotel and was getting ready to tackle the second days’ filming the sky became overcast. It is alleged he phoned the Met. Office at Birmingham airport and asked when the sun would come out, only to be told “Not today in Brum. To get any sun you will have to travel south”. This explains the sudden appearance of the Cotswolds and Bibury Fish Farm in the middle of the film on Birmingham. Bibury is about 70 miles south of Birmingham by road. Images of the rich golden Cotswold stone of the village of Broadway allows Baim to give the line “You can give my regards to this Broadway anytime” to Telly Savalas, who did not visit any of the locations for the filming of these three titles. Savalas recorded the script provided by Baim at the studios of De Wolfe Music in London’s Soho. It seems Harold Baim was solely responsible for the subject matter of his “quota” films and the people who worked on them. Baim is credited with discovering Michael Winner giving him his first on-screen credit as a writer and director on four short films and a feature film. Baim funded the productions and licensed their use to United Artists and other distributors. To guarantee that these “quota” films could be made there was an industry administered tax on cinema seats known as the “Eady Fund” after one Phil Eady who devised the system. The more “bums on seats” the more money the producer received. A short 15 minute film received more – double - money that longer 30 minute “Quota-Quickie”. So, the short film accompanying the Beatles A Hard Days Night was a real money-spinner. However this film, called Jugglers and Acrobats, has not been seen since its first release and was probably not watched in any detail by the excited, screaming and adoring Beatles fans who had only turned out to see the main feature. Not one frame of Jugglers and Acrobats has ever been broadcast. The negative was stored away by Harold Baim together with about 150 other film titles - and that was that. It turns out to be a unique record of the last “Variety Acts” – Winston Foxwell, Vic Templar and Della Sweetman, Bobby Daniels, Verinoca Martell, Peggy Bourne and others all perform amazing juggling and acrobatic acts for the camera. Where are they now? They are frozen in time on negatives stored in The Baim Collection. The film was widely seen on release and then, unlike A Hard Day’s Night, put away and forgotten. Like most of Harold Baim’s films it “does what is says on the can” – in this case the rusty film can. Harold used well known voices from BBC Radio and Television to read his often pun-filled scripts; Terry Wogan, Nicholas Parsons, Pete Murray, Franklin Engelmann, Peter Dimmock and Telly Savalas to name but a few, all voiced a Baim film or two. The music for nearly all the films came from the well known and popular De Wolfe Music library. Harold’s films won little critical acclaim when they were first released. Indeed in a book published by the cinema technicians union, the ACTT, in 1966 they said: “… one of Mr. Baim’s more recent productions, A Day with Dino, was entered into the Cork Film Festival in 1965. The British representative on the jury had the greatest difficulty on persuading the remainder of the jury to sit through even 5 minutes of the film.” Harsh criticism indeed from other producers concerning a 30-minute film which followed a day in the life of a Venetian gondolier. The film did eventually win a festival award; the criticism came from contemporaries who had not achieved the commercial success of Harold Baim. Harold Baim died in 1996. He was in his 80s. His legacy is a collection of films showing a colourful window on life in the middle of the last century. Richard Jeffs who acquired the entire collection saw the films as “part of our social history” and thought they must be preserved and not split up. The Baim Collection is one of the largest collections of its kind in private ownership. Richard Jeffs acquired all rights to Harold Baim’s work together with all the surviving film prints and negatives. He moved their storage, about 1500 cans to Todd-AO (now Ascent Media) in North London and slowly set about a project to restore and digitise all the titles. “I sometime feel I’m a one-man BFI when it comes to these films” he says. After ten years he has achieved about a third of the project and has now seen 50 of the 150 titles. “It’s a great frustration that I have yet to see two-thirds of the films, and it’s a great excitement when I get another film cleaned and copied. I have enough titles now to consider releasing some of the films on DVD in the hope that brings enough income to finish the project. I’d love to see the films on a big screen in a main cinema. That is where they belong. The problem is that owners of small cinemas I have spoken to say that playing an extra film would put their staff costs up too much. Small cinemas operate on such small profit margins it is not possible to add a “quota quickie”. Playing an extra film would mean paying staff to run a cinema after ten o’clock and extra payments would use up any profit. 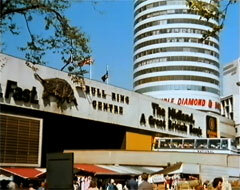 I do release the Telly Savalas Birmingham film at least once a year to be shown in the City. I have given copies on DVD to the social history department of the Central Library in Birmingham, so anyone visiting the City can see the film for free at any time. Baim’s first films, made during the Second World War, show variety acts such as Wilson Keppel and Betty. His later travelogues now give us a unique glimpse of our social history – eight minutes were shown on BBC2’s Newsnight in 2006. This is Lebanon, and This is Jordan give us a glimpse of the Middle East in the early 1960s; an important record with web page reviews such as “The "Happier Times in Beirut" segment is a real jaw-dropper; it's incredible to see how cosmopolitan and beautiful Lebanon was in the early ‘60s, long before all the trouble started.” Richard Jeffs says that such comments justify the continued restoration of the films. The films do make people happy. Richard recalls receiving at e-mail from a man in Essex asking for a copy of one of the Devon films. The correspondent had recently returned home to Essex from a long weekend in Devon with his family. He wrote “It started raining and my granddaughter and I were next to the Museum so we stepped in to avoid the shower. As soon as we stepped inside we saw a large flat-screen TV set playing a big colour film. On the screen I could see myself aged 11, my older brother, Mum and Dad and the two dogs. We were all eating lunch outside a bathing hut in 1957. I’d forgotten the film being taken, but on seeing the film I remember it being made. We had to it wait twenty minutes for the film to play again so I could show my granddaughter her great grand parents and how we had holidays all those years ago”. The Museum put the chap in touch with the South West Film Archive who had organised the showing of the film. In turn they linked the chap to The Baim Collection and Richard Jeffs. The Radio programme Telly Savalas and the Quota Quickies was the idea of radio producer Howard Shannon. With presenter Professor Laurie Taylor the programme investigates the history of the films and why they are popular with audiences today. We played the Telly Savalas Birmingham film to an audience of over 200 in the centre of Birmingham and they really enjoyed seeing the City of 28 years ago. The City has been redeveloped and changed dramatically since the film was first released in 1981.